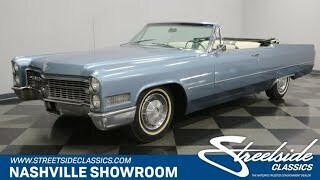 Hi, I am interested in your 1966 Cadillac De Ville (stock #1025-NSH) listed on Autotrader for $18,995. I'd like to get more information about this vehicle and confirm its availability. This car is made for kicking back and cruising down the road in style. It is also the kind of car that epic long-distance road trips are made of. Trying to use it as a getaway car didnt work too well in the movie Hot Pursuit, although watching Reese Witherspoon and Sofia Vergara try was pretty funny. Long straight lines define this car, especially when the top is down. There are only two doors in the 130 inches between the wheels so the medium Blue paint has a lot of real estate to look good on. Up front, the quad headlights were switched to a vertical arrangement perched at the front of the fenders in contrast to the horizontal arrangement on the older models, which created a wider grill. The parking lights were integrated into a bold chrome bar running through the middle of the rectangular mesh of that grill which is underlined by a bumper that follows the contours from side to side. Of-course the long hood leads proudly with a Cadillac crest. A long straight line of chrome side molding runs front to rear passing just over the rear wheel spats that add to the awesome look. Fins were getting smaller but are still present capped by big tall taillights that are integrated with the rear bumper. Open the door and slide in, or just hop right over them, and you are in an interior that is as spacious and comfortable as your living room in both the front and back seats. There is a substantial pull handle on the inside of the door that makes closing it easier once you are in, and once there, the window switches are at your fingertips. The Blue and White interior is very stylish with the power operated white convertible roof matching the white seating surfaces which are trimmed in blue. There is a three spoke steering wheel with a Cadillac emblem in the center and a horizontal speedometer with a unique feature for 1966, adjustable automatic dimming headlights with programable Sentinel delay. The controls for the climate control system are on the right side of the column just next to a glove box which is in the center, because, you know, the passenger side of the car is way out of reach of the driver. We wont even mention how big the trunk is. Under the hood you will find a 429 cubic inch engine that has plenty of power to get this car moving off the line, although its not about wheel spinning horsepower as much as it is big torque that gets things moving without a lot of drama. The engine compartment is understated too with gloss black the theme of the day and valve covers that have Cadillac embossed into them. The power is sent back through a 3-speed automatic transmission to the rear wheels and there is a newer exhaust system on the car so you can cruise quietly and enjoy the music or the conversation. The car rides on 235/75R15 white wall tires mounted on steel wheels with full hubcaps with the Cadillac crest in the center. Top down cruising in 60s Cadillac style. Maybe as an enjoyable way to commute, or as a road trip in the making with your friends. Whatever your desires are, come on down and check out this classic Caddy.